Senate Minority Leader Sen. Chuck Schumer, D-N.Y., holds hands with student activist Matt Post, right, during a student gun control advocates rally outside the Capitol Building in Washington, March 14, 2018. Students walked out of school to protest gun violence in the biggest demonstration yet of the student activism that has emerged in response to last month's massacre of 17 people at Florida's Marjory Stoneman Douglas High School. As students staged a coordinated school walkout in districts across America, U.S. lawmakers on Wednesday grilled federal officials on the failure to act on repeated warnings about Nikolas Cruz, the alleged gunman who killed 17 people at a Florida high school last month. “It appears that the FBI did not communicate with local law enforcement,” Senate Judiciary Committee Chairman Chuck Grassley, an Iowa Republican, said. “There was a catastrophic failure at every single level (of law enforcement) that occurred here which made this shooting possible, and we have to find a way to plug those holes,” Republican Senator John Cornyn of Texas said. The Senate panel met as throngs of students and activists converged outside the Capitol and in other locations nationwide to demand restrictions on firearms. 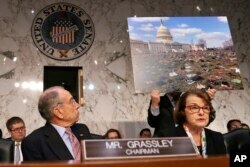 Senate Judiciary Committee Chair Sen. Chuck Grassley, R-Iowa, left, looks at a poster of 7,000 pairs of shoes that were displayed outside the Capitol Tuesday to represent victims of gun violence since the shootings at Sandy Hook Elementary School, as Ranking Member Sen. Dianne Feinstein, D-Calif., right, speaks during a committee hearing on the Parkland, Florida, school shootings and school safety, March 14, 2018, on Capitol Hill in Washington. Democrats backed their call. Senator Dianne Feinstein of California noted that the United States has suffered more than 200 school shootings in the last five years. Most Democrats favor establishing universal background checks for all gun purchases as well as reestablishing a ban on the sale of semi-automatic rifles. 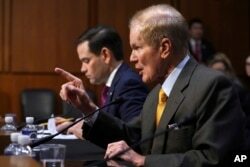 Sen. Marco Rubio, R-Florida, left, listens as Sen. Bill Nelson, D-Florida, speaks during a Senate Judiciary Committee hearing on the Parkland, Florida, school shootings and school safety, March 14, 2018, on Capitol Hill in Washington. By contrast, most Republicans back measures to boost law enforcement’s capability to detect dangerous individuals and prevent gun sales to those deemed a security risk, rather than banning entire classifications of firearms or subjecting every gun sale to a background check. In addition, President Donald Trump has directed the Justice Department to craft regulations banning the sale of so-called “bump stocks” that dramatically increase the number of rounds a semi-automatic rifle can fire in a given time period. He has also voiced support for allowing trained teachers to carry firearms in schools. Weeks ago, Trump appeared to endorse universal background checks as well as raising the minimum purchase age for assault weapons, but reversed himself days later. “There are things we (Republicans and Democrats) agree on. We should pass those things,” Florida Senator Marco Rubio said. “We must rally around consensus,” Grassley said. Democrats countered that limiting congressional action to the lowest common denominator of measures palatable to majorities of members in both parties will not prevent future mass shooting incidents. FILE - Senate Majority Leader Mitch McConnell of Kentucky speaks during a news conference on Capitol Hill in Washington, July 12, 2016. On Wednesday, Senate Majority Leader Mitch McConnell, a Kentucky Republican, announced his support for a bipartisan proposal to provide federal funding to train school districts and local and state police forces to identify security threats, form crisis intervention teams, and boost security infrastructure at schools nationwide. “We use a variety of security measures to protect workplaces and government buildings across America. 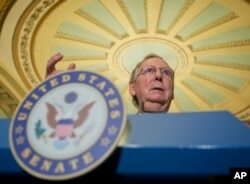 We ought to be able to do the same to protect our children,” McConnell said in a statement.